We have spent SO long looking through all the fabulous submissions which you supplied for us last week and choosing just a few was such a difficult task. So many LIMettes submitted multiple times and many submitted posts with multiple cards on and we are SO grateful for all the wonderful support from so many of you for our attempt at 1000 cards in one week. We have been encouraged to try for it again sometime... well we'll see... that was a lot of commenting to do... it makes commenting on a couple of hundred per week seem more like a walk in the park... yet that in itself takes us a long time! One thing we have noticed is how much more comfortable lots of you seem with the genre and are sometimes producing one layer cards from choice! Thanks go to you all, especially those who tried SO hard to help us try to achieve our goal, we'd love to name names, but would hate to miss anyone out, so HUGE thanks to YOU ALL. Here are some which caught our eyes last week. HUGE Thanks go to Loli for this last submission. She waited until moments before the challenge ended to post it so that it would be the last one for us. It brought a lump to our collective throats. Please collect your showcase badges from the new badge page at the top of the blog, and we hope you will display them with pride! You girls certainly know how to keep us busy and what a TREMENDOUS effort on the part of SO many LIMettes. It was almost with tongue in cheek that we suggested that we try for 1000 submissions in one week, but you very nearly did it, congratulations everyone! We are absolutely delighted. Our eyes are now rectangular and our fingers are flat! We visited everyone, but we couldn't leave comments for all... there were quite a few submissions with Word Verification still in place and this takes so much extra time, which this week we didn't have! After making SO many comments, it would have been wonderful to receive a few more on our own personal blogs, but there are still some problems on accessing Chrissie's blog we understand. This is a digi image from A Day for Daisies. (I really got into my pears the other week), which I printed and masked before adding the stamping from three Paper Artsy stamps. The pears are coloured with Promarkers and the sentiment is from Stampin' Up stamped with Memento ink in London Fog. This one involves a little bit of simple recycling. It always seems such a waste to throw Christmas cards out after the celebrations are all over and so the ones I don't send for official recycling, I keep back for reuse on my cards. There were five little robins in a row, I now have five little cards with a robin on each! The corners were cut with my new Crop a Dile Corner Chomper and the image mounted on some red backing with small pearls added to the corners. The sentiment is another from the same SU set as the first card. As the sentiment is printed on the computer I needed to do this on an A4 sheet first. I worked out the position using a scrap sheet. The font is Champignon. 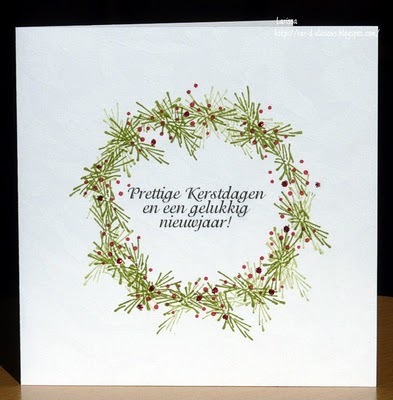 This is a 6" [15cm] square card. The square panel is about 8cm square. Once the sentiment was printed, it was scored using a score board, folded in half lengthways and 6cm was trimmed off, making a 15cm square card base. I cut the square and stamped the Anita's daisy flower randomly in Stampin Up Tempting Turquoise and Old Olive. 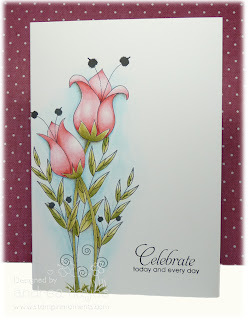 I joined the daisies with lines and leaves by hand using a Stampin Up black marker. Finally I added the 6mm black gems to the centres of the 3 whole daisies. The panel is mounted on 3D foam. I had a bit of a lesson from Chrissie, as to how to do inked backgrounds! [She is SO FAB at it, as you know]. 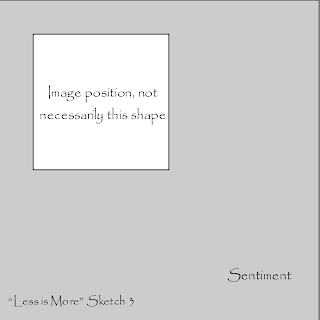 Taking a sheet of smooth white cardstock roughly measuring 7cm square, I inked the background. [There was no need to mask an area as I was trimming to size later] Whilst this isn't perfect I thought it was 'OK' I used Stampin' Up ink pads Rich Razzlebury, Melon Mambo and Peach Parfait and made the effect using SU daubers. 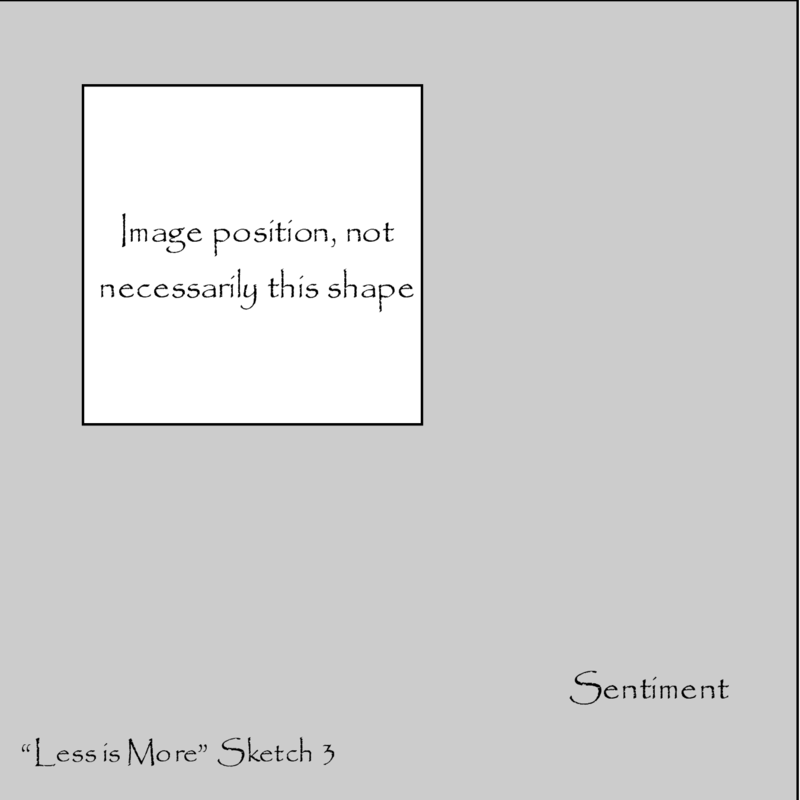 The process of the sentiment placement was easy as it's the same as above! This time the font is Dear Joe 1 M&S. I stamped the Hero Arts Palm Tree onto the left hand side of the panel. To finish I stamped over the square with Versamark and heat embossed it with clear powder. The panel is mounted on 3D foam. Can I give a last shout out for my Stampers 6 Club. Stampin Up products are fabulous, high quality, with matching card stock and inks, also some ribbons, buttons, etc. You really will not be disappointed. I can also promise you service to match! We don't expect that there will be 1000 submissions this week, but we'd like to welcome back all those who joined us for the first time this last week and hope that you'll join us on a regular basis. We would love it if you could visit other LIMettes to leave a friendly comment. Big thank you to ALL our LIMettes as always to you all for your participation. We are sure you will agree these 4 ladies have created something extra special! THANK YOU for all your entries this week, you have excelled yourselves, but without appearing too pushy....KEEP 'EM COMING! What wonderful doubles we saw last week, once more choosing our ShowCASe will be a difficult job, but watch this space for our choices later in the week. Now we are going for the 1000 submissions. If you make more than one card for us, you will need to post them on your blog and submit them separately, for each card to count towards our target! You are doing SO well, thank you all! We hope that the scope of the challenge doesn't leave you wondering what to do... you could use any of our previous challenges as inspiration, CASE a card which has given you inspiration (as long as you credit the original crafter with the design), or just do your own thing. You may enter as many times as you wish as long as each submission is with a different creation. Let's go LIMettes, how many can we reach? We may leave blanket comments to show that we have visited you, so we hope you'll excuse that on this occasion. To achieve perfect placement of coloured blocks, I placed scraps onto the square of card [13cm x 13cm] I then printed the sentiment on the computer, Cherish font. 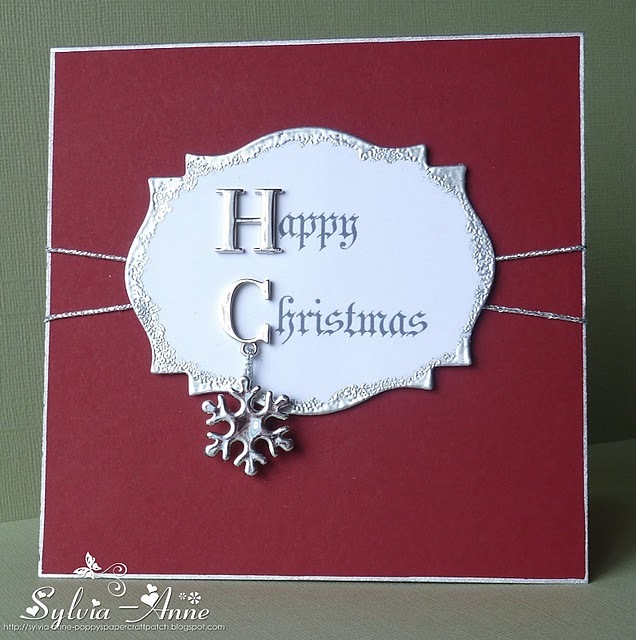 I embossed the blocks with my Crafts Too embossing folder, keeping them in the same order as the finished card to achieve the following on design. The fabulous butterfly, I've had forever! One of my first purchases. It's from Creative Stamping, I doubt it's still in production. The colours are Stampin' Up: Real Red, Pumpkin Pie and the new Calypso Coral. The butterfly was stamped onto a scrap piece of card, coloured and and I cut out the wings only. I curled them for a 3D look. 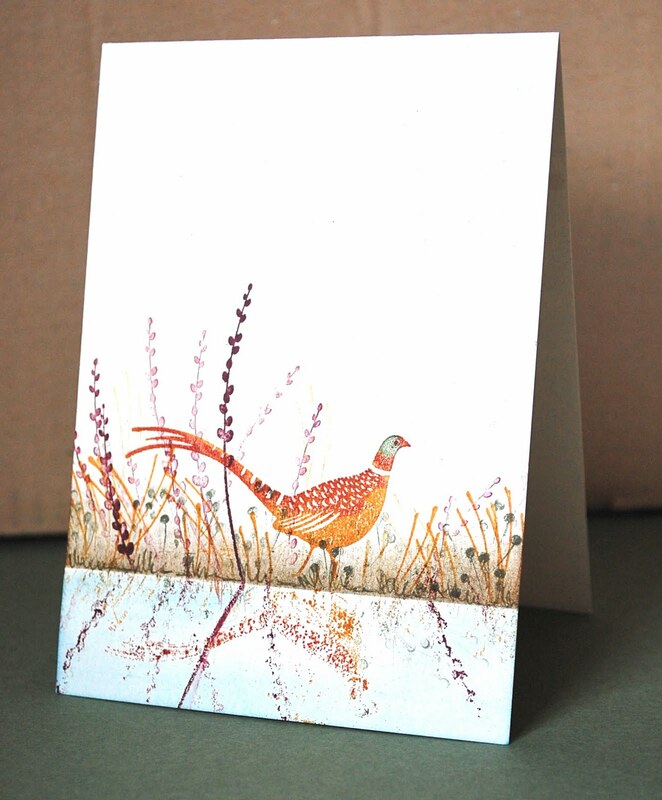 The body is stamped directly onto the card base, using a Stampmajig for perfect placement. The second card is made in much the same way, but, the sentiment was stamped from an old SU set. 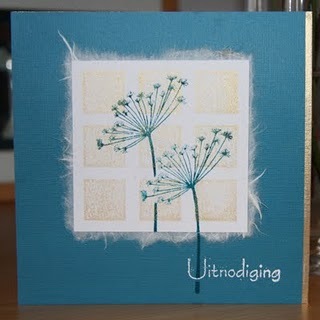 the colours are from Stampin' Up again. Pear Pizazz, Melon Mambo and another new one Island Indigo. I finished off with my favourite bling! I bought the rhinestone embellishment here. Here is a really simple little card with a gorgeous digi image from A Day for Daisies, aren't these ducks just the cutest! I think it would be a prefect for anyone having triplets too, but you don't need one of those cards every day! It's a Stampin' Up sentiment. This one is a simple little card using a Stampin' Up Delightful Decorations bauble stamp adapted to make a vase. I simply put some sticky tape across the bottom of the stamp before inking with Versamark, and then pulled it off before stamping. 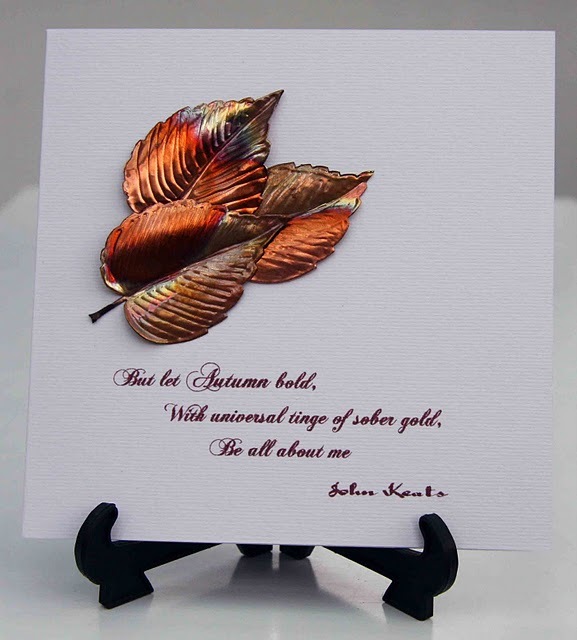 I embossed the image with Fine Detail Gold embossing powder. This was then punched out using the SU bauble punch and the bottom of the card cut off leaving a similar border as around the rest of the stamp. The flower is from SU's Silhouette Sentiments and the sentiment from SU Happy Moments. The border punch is Martha Stewart. 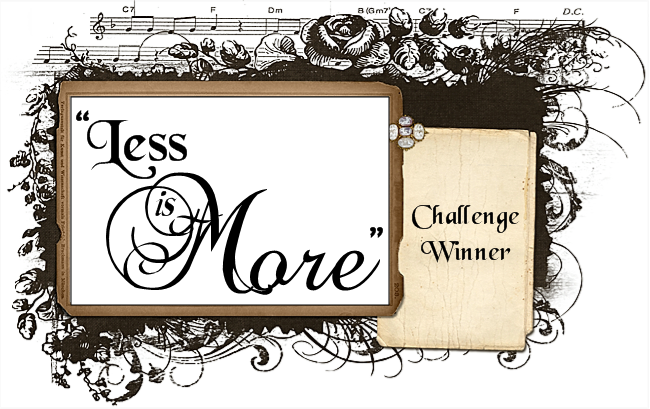 Here is our ShowCASe of some fabulous submissions from our Metallic challenge. We were amazed by the variety of wonderful techniques in evidence from LIMettes this week. Next week we are going to have a crack at seeing just how many submissions LIMettes can post on "Less is More" in one week. We are doing something unprecedented and letting you know the theme in advance. SO next week ANYTHING Clean and Simple GOES! Get those CAS cards ready...will we manage 1000 submissions in one week... who knows? So on your entry this week, we'd like to see TWO of something. My cards for this week both involve using a stamp twice, but each one employs a different technique. 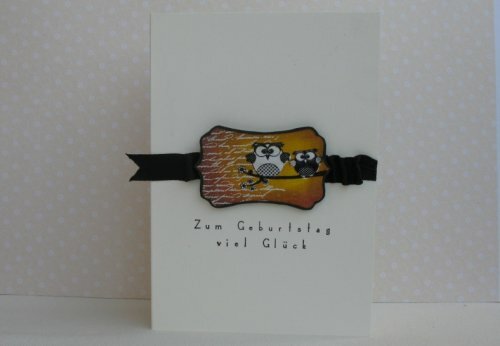 This one uses a fabulous pear stamp from A stamp in the Hand, which is a completely flat stamp. 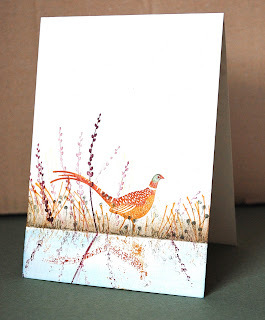 I inked the stamp with Shabby Shutters Distress ink, then dabbed a little wild honey onto it using a Decopatch brush. After this I inked around the edge of the stamp with some Forest Moss Distress ink, both directly from the pad and also with another stiff brush. I then inked the text stamp from the SU French Foliage set, in Forest Moss and stamped this onto the pear stamp (Kissing Technique). I then stamped it onto the card which had already been printed with the sentiment on the computer. The fonts are Abadi MT Condensed and Eutemia I. Note to self: Ensure the text stamp is aligned similarly on both images in future! 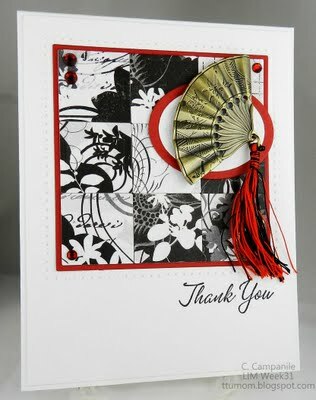 This one uses a stamp from the SU Silhouette Sentiments Set, Stamped twice without re-inking to imply the shadow effect.. I stamped over a straight edge mask to ensure that the branches ended at the same point on the left. The sentiment is from Unity Stamps. I have a few doubles on my cards! 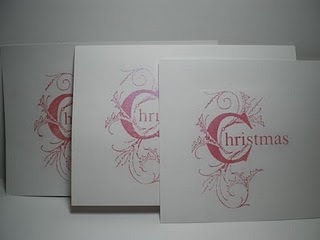 Firstly the fact there are 2 of them, two cards for two friends! The stamping technique is two step stamping, whereby 2 stamps are needed to make the complete image, an outline and a 'fill' solid design. 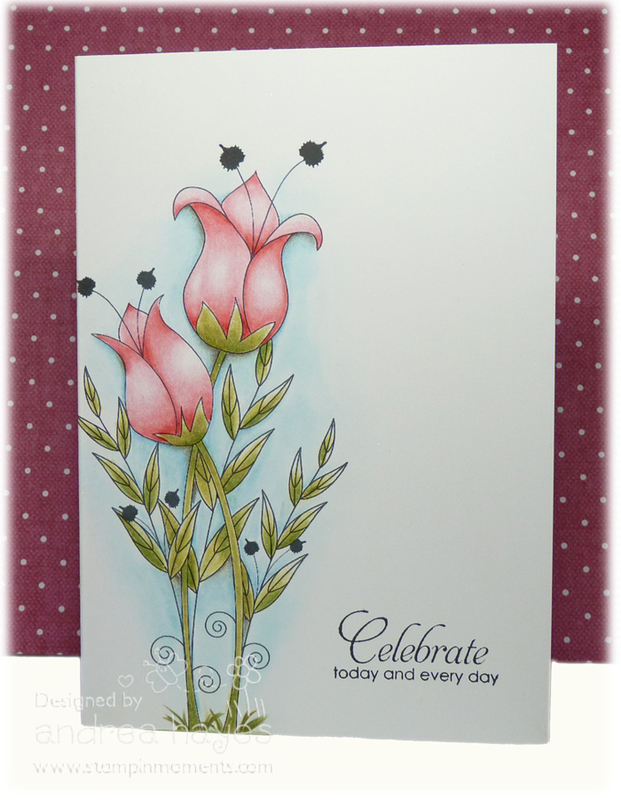 So although there is only a single flower, it is double stamped! They are from Close to my Heart and as they are clear, you mount them onto an acrylic block, therefore positioning is easy! Having said that with this kind of 'loose' design I rather like it placed slightly 'off'. The pink is a Brilliance ink and the green is one of the fabulos new SU In colours! This is so fresh and new it's very wet, therefore making a less solid effect. Have to say I quite like it looking 'smudgy' A quick fix would be to add a bit of Quickie glue and glamour dust! 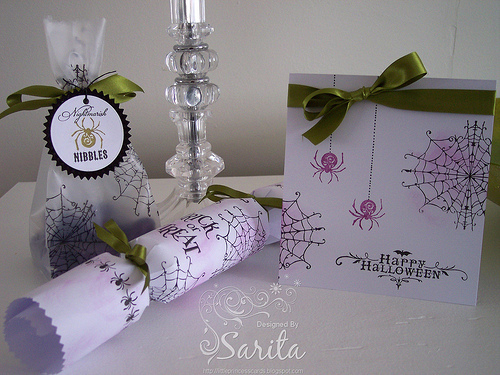 The twine is from Pretty Little Ribbon Shop. The double ends are made by sticking 2 gems, black in this instance, back to back over the cut end of the twine. 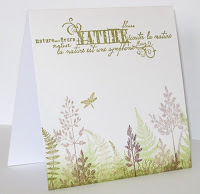 For my second card, I stamped a fern branch from the fabulous Inkylicious set 'Meadow Breeze. in an aqua colour. 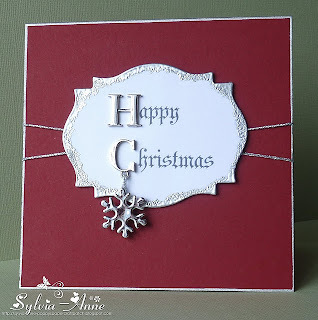 It's an excitig new colour from Stampin' Up. All will be revealed October 1st! There are 5 new colours in their 'In Colour' range, they are all lush! 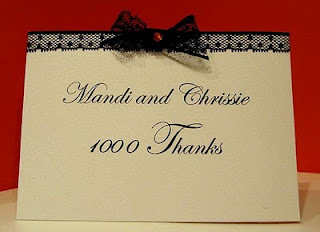 I then stamped again in Versafine Onyx Black, as is the 'Thanks' which is from CTMH. The ribbon is just from my stash. To create the little bow I punched 2 holes on the stems and threaded it through both holes from the front, then threaded the ends back up again, on opposite sides then trimmed to finish. If you would like to have a catalogue but not join the club (they are free for club members) they can be purchased from me for £4.00 including postage. So here you can see four different ways of using double stamping, We're wondering how many other ways of having 'double' of something, our wonderful LIMettes will come up with. We leave hundreds of comments each week and if you could spare the time to visit our personal blogs we'd love to have some comments from you too. Thank you to all those LIMettes who regularly visit us and leave us words of encouragement, we truly appreciate it! Blogger was playing silly kids this week and so apologies to anyone who tried unsuccessfully to leave Chrissie a comment, she appreciated the thought! We are delighted to announce our winner for August. You will all know her and agree she is a worthy winner. Tara tirelesly runs her challenge blog and raises funds for a worthwhile charity. Do stop by, if you haven't already. please contact us and we will arrange for your prize to be sent. See you all tomorrow with the next challenge! Another week of inspiration from the LIMettes and we had a wonderful time mulling over the entries for this week's ShowCASe. So in the order in which they were submitted, here are our choices for this week and I think you must admit that they are really stunning! How bizarre.....must be all that commenting, fuddled our brains! Thank you Val for reminding us! Aren't we lucky to have such wonderful contributions to our challenges. DO please take our ShowCASe banner and display it on your blogs with pride and accept our grateful thanks. Thank you all for your good wishes following our last post... we're delighted to have so many of you on board. We certainly enjoy seeing all your submissions. We'd like to see CLEAN & SIMPLE cards with something that has a METALLIC finish to it... ink, embossing, card, charms, actual metal... come on people let's get creative! We are delighted to be sponsored by The Craft Barn this month. They are generously donating £20 voucher to the winner. We are a UK business selling a wide range of craft supplies for cardmaking, scrapbooking, home decor and gift projects including stamps, inks & paints, dies & embossing folders and stencils. We are committed to providing the best, most up to date craft products at great prices, coupled with first class service. Some leading brands that we stock include Hero Arts, Stampers Anonymous and Tim Holtz, Crafty Individuals, Martha Stewart, Spellbinders, Marianne D, Copic Pens, Viva Décor and Cosmic Shimmer to name but a few. We are constantly adding new products to our range of craft supplies so be sure to add us to your browser favourites so you can pop back to see us. This card has a triple embossed tile. Here is the method I used to make it. Repeat stages 2 & 3 a couple of times. Sprinkle with different coloured metallic EPs and reheat... I used Copper plus Silver and Gold Sparkle. Ink a deeply etched stamp with Versamark (I added some Black Memento too) and press firmly and evenly into the still molten tile and hold for several seconds. The impression had a few little etched circles in it so I popped some gems into them. This one uses a piece of metal foil which I bought ages ago and didn't get around to using until now. I cut it out with a Nestie and embossed it in a Cuttlebug embossing folder. I thought to add a little interest I'd swipe it with some brown Stazon and discovered that it made a really pleasing effect..it removed some of the colour from the foil in places and left its own colour in others, I thought it looked rather nice. The depth of embossing made me decide to mount it into a recess in the card and so mounted the panel section on dimensional pads. The three butterflies using the three colours used in the card are cut from Marianne's Creatables dies. The sentiment is from part of a Cuttlebug die. Cut a panel of white card approx 12.5cm x 5.5cm. I began by rubbing a Versamark silver inkpad around the edges, coming further in at the corners. Taking a clean tissue I buffed all over the panel, which draws out some of the ink. I then stamped the leaf design randomly as you can see. The leaf spray is Creative Expressions. I also stamped onto the card base. The little elf, also Creative Expressions, is stamped over the whole lot in Versafine Onxy Black. Lastly as it's metallic week, I took a gold Versamark pad and lightly added to the bottom right and top left corner, plus a few touches on the leaves on the cardbase using a cotton bud. (Q Tip). To finish I mounted the panel onto 3D foam. I refrained from adding a sentiment as I don't think it needs it! NB The sentiment appears wonky...it isn't I assure you, it's the angle of the photo! Not too much to say really. Circles using Stampin Up 3/4" punch, then varied decoration. That lovely metal flower brad is Stampin Up too. Photographing shiny metallic card is a nightmare isn't it. I'm by no means an expert, but, what I did this time was to stand much further back and then zoomed in. Seems to have helped stop any reflections! There are only 4 places left, so please hurry, before they are filled. It's a fabulous time to join as the brand new catalogue is out on October 1st...its full of FANTASTIC new products.....so exciting!